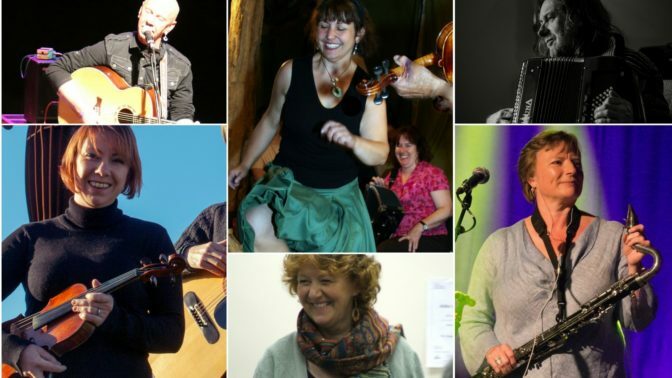 This is the seventh year of our folk music, dance and song summer school – for all ages and abilities – led by a crack team of tutors who have detailed knowledge and extensive experience of a wide spectrum of folk music. There will be groups for dance (Kerry), song (Carolyn), fiddle (Sophy), accordion (Paul), guitar (Kevin) and mixed-instrument (Jo), and the programme will be fluid enough for you to move from group to group should you wish. One of the course’s special features is, throughout the week, we will work towards a full-group ensemble piece, with the whole summer school. This is a powerful way of bringing everything we do, and all the participants together, in one shared experience, allowing you to learn about how to structure a performance, work together, use all levels of skills (in small and large groups) – and create something that’s amazing and all inclusive!